Pin-up featured in Decay #12 comic book - April 2012. Pen and Ink line drawing with computer colouring. 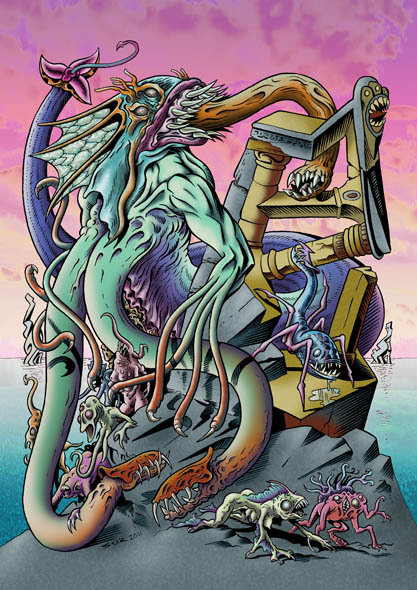 "Spawn of Dagon" inspired by HP Lovecraft. Published by Dark Oz, Editor - Darren Koziol. Also featuring the talents of John Stewart, Glenn Lumsden, Jason Paulos, Ryan Wilton, Lee Smith, Danikah Harrison, Nahum Ziersch, Tanya & Owen Nicholls, Colin Wells, Emerson Ward, Jan Scherpenhuizen, Dénes Nagy, David Williams and Dave Heinrich. Decay comicbooks available here or at all good comicbook specialty stores.